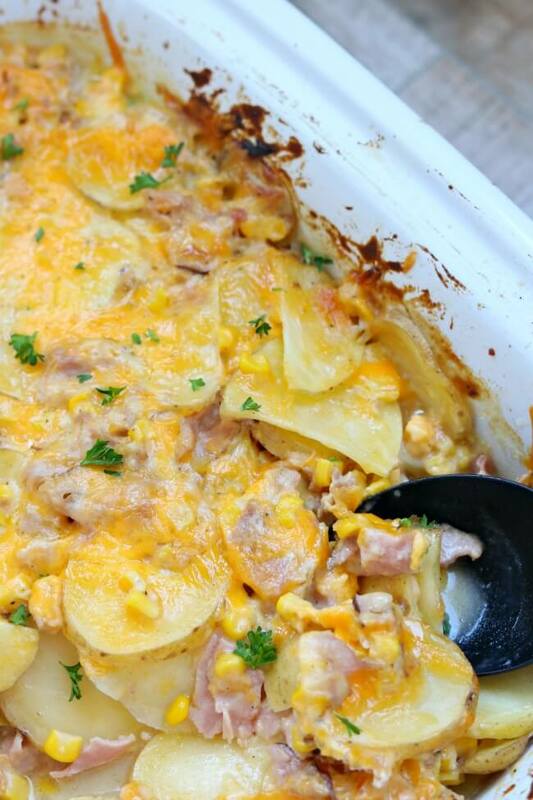 Slow Cooker Cheesy Scalloped Potato Casserole–thinly sliced yellow potatoes, cubed ham and juicy sweet corn enveloped in a velvety cheese sauce and baked all day in your slow cooker. 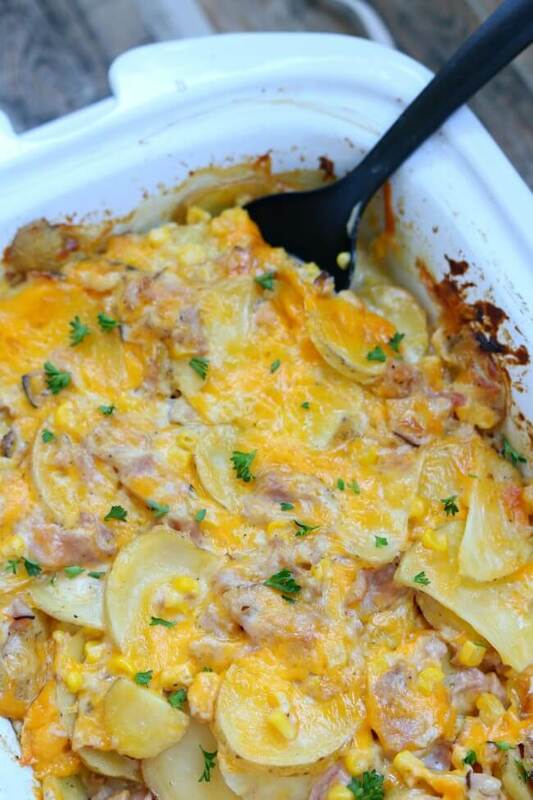 Have you ever had a ham dinner that included some cheesy potatoes and corn? 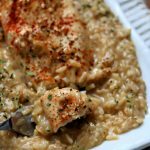 Now all of those good foods are combined together in one tasty slow cooker casserole (don’t worry the jello isn’t included in the casserole). You’ll start by slicing some yellow potatoes fairly thin, probably about a quarter inch. Then you’ll whip up a creamy cheese sauce that is so much better than a can of condensed soup and takes less than 5 minutes. The potatoes and cheese sauce all go in the crockpot along with a can of corn (you could use frozen corn too) and some cubed ham. 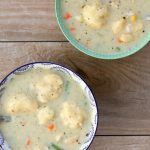 You’ll bake this recipe in the slow cooker all day long and some home to a comforting, delicious dinner. 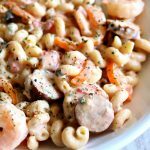 Another idea is to use this recipe for a potluck dinner. Spray 3 quart casserole crock* or 6 quart oval slow cooker with non-stick cooking spray. Place thinly sliced potatoes in the crock. Lightly salt and pepper the potatoes. Melt the butter in a saucepan over medium heat. Stir in the flour, salt and pepper. Add the milk all at once and cook, stirring constantly, until the mixture thickens and bubbles. Remove the pan from the heat and add 1 1/2 cups of cheese. Whisk until smooth. Pour the mixture over the potatoes. Gently stir in the canned corn and cubed ham. Coat the potatoes evenly with the cheese sauce mixture. Cover the slow cooker and cook on low for 8 hours, or until potatoes are soft. 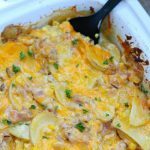 Potatoes take a while to cook so be patient and start this recipe early in the day! Sprinkle the remaining cheese on top of the casserole. Let the cheese melt and then serve the potatoes. 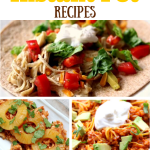 *I use my 3-quart casserole crockpot for this recipe. I cut up a couple of pounds of pork chops is that going to be cool and said ham? 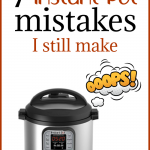 Could you use a regular crockpot? I don’t have a casserole one. I’d like to make this to take to a potluck dinner, I would double the recipe. Any idea if I should also increase the cooking time? You may need to add an hour to the cooking time. Will you be making it in a 6 quart slow cooker? I’m not sure if mine is a 5 or 6 quart, it’s an oval one. I don’t even have 8 hours for the cook time, I figured I would do it on high for 5, and see how it is after that. Fortunately it’s a Saturday so I will be home to monitor it. Hi! 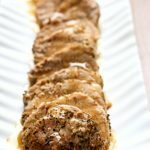 Would it be possible to set everything in the crockpot, mix up the sauce, pour it on but not cook it until the next day? I don’t think so. The potatoes would get all gray and gross. You could do everything else the day before besides the potatoes if you wanted! wow! what a good trick. Thanks. Great question. I would suspect that it would take at least an hour at 350. Potatoes take a while to cook. I would cook it covered with foil for an hour and then remove the foil, check the potatoes and go from there! WIll you let me know how it goes? Thanks.